UNITED NATIONS, January 25 -- Amid the suffering of the Haitian people, the UN's accelerating spin of its own centrality in the aid effort was on display on January 25. 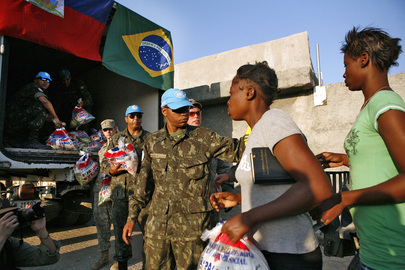 In Cite Soleil on January 24, a distribution of food and radios ended with UN Peacekeepers' deployment of tear gas and shooting into the air. Inner City Press asked the UN's principal deputy in Haiti, Tony Banbury, about it. Video here, from Minute 27:34. Banbury said he was aware of the incident, that "distribution [had] not gone according to plan." But then the UN's director of communication in Haiti David Wimhurst passed Banbury a note and cut in. He said he had been there and that the distribution "went extremely well." He clarified that at the end, when they had run out of food to distribute, people "got upset." But when Inner City Press asked him about the AFP reported tear gas, shooting in the air and leaving piles of radio behind for people to fight over, Wimhurst said he hadn't seen any of it. Video here, from Minute 29:50. Previously, Wimhurst chided the Press for reporting on Haitian dissatisfaction with and protest of snafus in aid distribution. It's one thing to advocate for the media to cover your organization differently, quiet another to describe a distribution that ends in tear gas as having "gone well." Later on Monday, Inner City Press asked World Food Program director Josette Sheeran dissatisfaction, including by the government of Thailand at the cost WFP would charge to transport rice it wants to donate to Haiti. Ms. Sheeran said that because of violence at food distributions, a way had to be found to be sure to reach women. Inner City Press asked, do you do distributions by gender? Ms. Sheeran said yes. In fact, the distributions are limited to women. She was asked, what about households headed by men, including where the mother died in the earthquake. We'll deal with that later, Ms. Sheeran in essence said. Video here. She impliedly chided, while appearing to praise, donors like Thailand who go bilateral, saying they better be sure their donations can be overloaded and stored. Banbury, who previously competed with Sheeran for the top WFP post, derided small NGOs who send a single plane with a few tents but "want a seat at the table." Video here, from Minute 32:28. Oh, civil society. Inner City Press had asked Banbury to compare the reaction of government in Haiti and in Myanmar, where he worked on Cyclone Nargis while at WFP. Banbury sidestepped Nargis, in which the UN system allowed the Than Shwe military government to siphon off up to 25% of aid in forced foreign exchange transactions, and focused rather on the UN's response to the tsunami, in Ache and Sri Lanka. Of the latter, he neglected to mention the widespread diversion of aid by the Rajapaksa government, which later used resources to bomb Tamil civilians in the north. Monday's noon briefing ended with Inner City Press asking UN Spokesman Martin Nesirky two simple questions about Haiti, the first about a Canadian helicopter owner who shipped two copters to a UN base in the Dominican Republic, where he says they have laid unused for a week. Nesirky said he would look into it, but told Inner City Press it could have asked Banbury, but chose to ask another questions. Inner City Press asked, since the UN was paying $94,000 a month rent for the Hotel Christopher which collapsed (and seemingly was not MOSS compliant), is the UN still paying rent? You could have asked that earlier, Nesirky said. "Let's see." Video here, from Minute 56:25. Footnote: Ms. Sheeran of WFP and her spokeswoman demonstrated and then gave out a so called high energy biscuit, which Ms. Sheeran said came from El Salvador. The label says Ecuador. We will have more on the this. On Haiti at UN, Dominican Dodging on Immigration, UNICEF on Staffing, IFAD to Forgive? UNITED NATIONS, January 22 -- The UN in New York was full of Haiti news on Friday, some of it misleading, other "off the record." At the day's noon briefing, by video hook up from Haiti Carlos Morales Troncoso, Foreign Minister of the Dominican Republic, bragged to the Press about his government's help to Haiti. Inner City Press asked about the blocking of sick Haitians, including infants, at the Dominican border. I haven't seen that report, Morales Troncoso replied. Video here, from Minute 25:57. Later on Friday there was a briefing by UNICEF about Haiti, but it remained unclear what information could be used by the press. UNICEF spokesman Chris De Bono introduced an official who could not, it seemed, be named. Inner City Press asked de Bono on the record why UNICEF had not been able to lead the water and sanitation cluster after the earthquake. De Bono replied that UNICEF had only ten international staff in country on the day of the earthquake, but was able to take over the WASH cluster by "day two." Inner City Press asked how many staff UNICEF has there now. De Bono said he didn't know, to email him for the answer. Inner City Press did, but as of 10 p.m., with a fundraiser on network television benefiting UNICEF among others, no response had been provided on how many staff UNICEF has in Haiti. 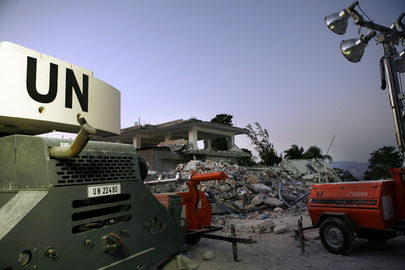 Rubble of UN's Christopher Hotel - was it MOSS compliant? Appearing with Ban Ki-moon on January 21, Bill Clinton was asked to which charities people should give. Only those with big presences in Haiti, Bill Clinton replied. So it would seem UNICEF should be able to say how many staff it had and has in Haiti. Inner City Press has also asked UNICEF about its operations in Sri Lanka and Somalia. "you asked a question, Matthew, yesterday, about the debt repayments by Haiti. The Secretary-General, of course, welcomes any efforts to ease financial burdens placed on Haitians. As for the International Fund for Agricultural Development, IFAD, it says it has supported, and is supporting, rural and agricultural development in Haiti through seven loans, for a total amount of $90 million on highly concessional terms. Six of these loans are now completed and closed. And they’re covered by the Heavily Indebted Poor Countries relief initiative, and consequently, the debt repayments are covered by debt relief. There is one loan not covered by that initiative, and repayments for this loan will not start before 2018. The Fund is now reviewing its approach towards these repayments with a view to call on its Member States to assist in directly supporting Haiti with further relief." Inner City Press: Can you either state now, or at the next briefing or in between, what material assistance is being provided to the families of those UN staff, both international and national, who perished in Haiti? And whether the benefits are the same, the material assistance? How, you know, between these two groups. And just what the number…? I’ve heard that [it’s] Schedule D of the benefits package, but I’d like to know what it is. Spokesperson Nesirky: I’m sure you would. And I’m sure that more than you, the family members would like to know. And that is being worked on very intensively, and it’s something that occupies the mind of many people, not least the Secretary-General. Inner City Press: But isn’t there a standard, I mean, isn’t there a UN policy? What I’m asking for is the policy, not actually what, what… You see what I mean? Spokesperson: Yes, I do understand. This has to do with insurance and other matters, and that’s being looked into very closely by the right people in Field Support, in the Department of Management, Department of Human Resources Management. Inner City Press: Sure. When a decision is made, you’ll…? Spokesperson: The question of payments of whatever kind to family members or those who were injured is really a matter for them, between the United Nations and them. The principle that you refer to, of course, is something that we would want to make public. Inner City Press: Isn’t it a public…? I mean, it’s a public organization. Spokesperson: That’s what I’m saying. The principle is very clear. It’s a matter of public interest, you’re absolutely right. And on the principle, we will make it clear what’s going on. But, the details are something for the family members.